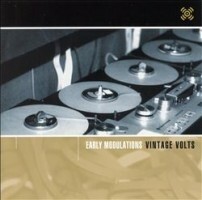 Early Modulations: Vintage Volts. Caipirinha CAI.2027.2. From Caipirinha comes a disc, somewhat different from their usual fare: Early Modulations: Vintage Volts is an excellent collection of some of the earliest electronic music (Caipirinha CAI.2027.2). Caipirinha is pronounced: ky-pee-REEN-ya. The program notes are gushy, using the distance of nearly half a century to slather these works with rosy sentiment. The notes imply that these are dusty pieces known only to collectors or academics and that they need to be rescued because they’re the harbingers of everything that is occurring today. There is some truth to this generous statement: today’s DJ’s use technologically enabled razor blade and splicing block techniques and this music did open up new worlds in musical expression. Despite a few inaccuracies and typos in the notes (I’m really not such a stickler for such details, but I’d like to see this CD get out there and influence a whole new generation) this is an excellent collection of pieces and a cool CD to have. This is disc is not biased by one studio, one movement or one continent. There’s Imaginary Landscape by John Cage, a re-release of Luc Ferrari’s Tête et queue du dragon from Ferrari’s days at Pierre Schaeffer’s GRM studio in the early 1950s. Schaeffer is represented by Étude aux chemins de fer. There’s also Iannis Xenakis’s Concert PH, the companion work to Varèse’s Poème Electronique at the 1958 Brussels’s World Fair, and Morton Subotnick’s Silver Apples of the Moon. There are works by Otto Leuning and Vladimir Ussachevsky licensed from the CRI, and from Max Matthews — the father of computer music — Bicycle Built for Two.